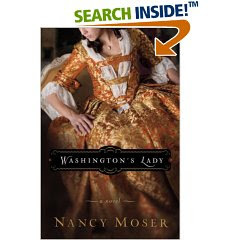 Today I'm over at 5 Minutes for Moms on a brief "guest post" talking about Washington's Lady, by Nancy Moser. Which I totally think you should read. Just to let you know how very much I enjoyed reading this book - I promptly went out and bought several other books by her including Mozart's Sister and Just Jane which I am very anxious to get to! I liked it that much! You can win a copy over at 5M4M today if you sneak over and leave a comment. As you know, I loved Just Jane as well, and can't wait to read Washington's Lady.